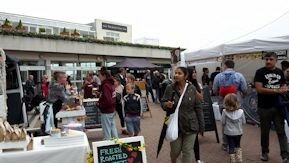 We arrived at the Sandown Park Food Festival in Esher on Saturday 17 September http://www.fantasticbritishfoodfestivals.com/sandown-park.html with great excitement. 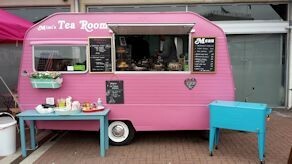 It was not only the first ever Festival, but it also gave us the opportunity discover new and innovative free from foods, that were dairy free and gluten free. 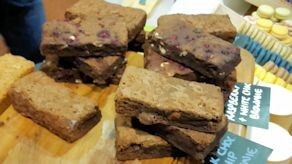 One of the biggest discoveries was Pinch of This, which calls itself “Gluten Free Gastronomy” www.pinchofthis.co.uk with its magnificent display of gluten free cakes such as raspberry and white chocolate brownies and multi-coloured macarons. Mark Renshaw from the company says he also produces dairy free versions, so we look forward to sampling those soon. 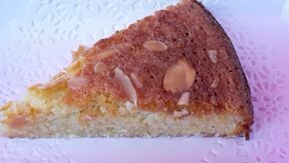 Talking of cakes, I sampled a delicious gluten free almond and coconut cake from Mimi’s Teas and Cakes www.mimisteasandcakes.co.uk from its bright pink van accompanied by a cup of tea with Alpro almond milk (as there was no soya) www.alpro.com/uk Apparently Mimi also makes vegan cakes and sells them at Greenwise in Fetcham, Surrey www.greenwiseshop.com which also has a café. Ray, who is dairy free, was wondering if he would find anything he could eat until he chanced upon Churros www.churrosgarcia.co.uk with its bright red stand. Churros, dairy free and vegan, are a traditional Spanish snack, sometimes referred to as a Spanish doughnut, but they are crispier and lighter than a doughnut – or so Ray says. Another find was the mouth-wateringly delicious marshmallows, aptly named Marshmallow Heaven www.marshmallowheaven.org , very different from the normal ones. 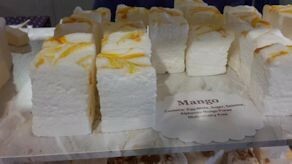 For a start, they are much bigger and they have imaginative toppings you wouldn’t associate with marshmallows such as rhubarb and custard, pineapple and mango. They really do melt in your mouth. 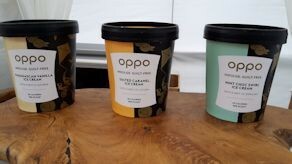 Gluten free ice cream could be found on the Oppo stand www.oppoicecream.co.uk, also described as “guilt free” as it’s 40 calories a scoop as it keeps the amount of sugar to a minimum by using stevia. Check out the web site for your nearest stockist which include Waitrose and the Co-op. 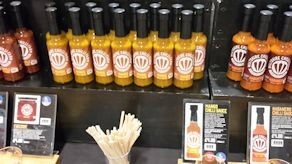 For those who like it hot, we found The Wiltshire Chilli Farm www.justchillies.co.uk with its amazing Mango Hot Sauce, guaranteed to perk up food. It’s gluten free and dairy free. A novel way of presenting tea was on the Basilur Tea stand www.basilurtea.co.uk At first glance, an array of beautiful books was on display, but, in fact, they were tin boxes containing a packet of Ceylon tea. These beautiful tins would make an unusual and surprising gift. 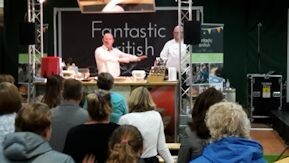 We enjoyed our visit to the first ever Sandown Park Food Festival and look forward to returning next year.